The inspiration to join the Navy came from my father, who passed away in 2009. He was a naval officer during World War II, and served in what was then called Scouts and Raiders, which later became the SEALs – special operations forces. He was assigned to the Asiatic Pacific Theater, supporting allies working on the Burma Road. After the war, my father served in the naval reserves and began a career with the Veterans Administration (VA). He finished his VA career in Puerto Rico, where I attended high school on a US Army base, Fort Buchanan. I spent a lot of time learning to sail in the waters off San Juan, and eventually took my passion and love of the ocean with me to Naval ROTC. 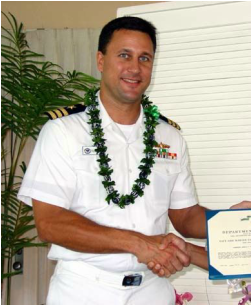 Upon graduation, I began my career as a Surface Warfare Officer in both active duty and reserve assignments. The service gave back to me a great deal of valuable experience. I learned the value of being part of something bigger than yourself: dedication to completing a mission, self-sacrifice for the betterment of the group, and the importance of teamwork. I had the opportunity to practice a number of important skills that will serve me well in my new career: leadership, delegation, commitment, camaraderie, and a high threshold for pain -- which translates to a high tolerance for inconvenience and ability to persevere to overcome obstacles. The opportunity to learn Salesforce Administration represents a “perfect storm.” It enables me to combine my recent military experience (operations, training, IT) with my previous enterprise software experience (telesales, business development, account management), to bring immediate value to the CRM team in a company in the technology industry. How can I contribute to this program? As both an experienced military veteran and former enterprise software employee, I have the maturity and ability to assist younger veterans who are new to the industry. I’ve dedicated the last several months to attending numerous technology-related workshops, lectures and Webinars to learn the latest in cloud, social and mobile -- I am well versed in SaaS and PaaS. I am confident in my ability to help drive top-line revenue for a company, and also to help others in making their military-to-civilian career transitions. VetMatch is a trademark of Veterans2Work. ©2019 Veterans2Work, Inc. All Rights Reserved.